At just 17, Nedžad Avdić was convinced his life was over. After days walking bare-footed, starving, thirsty and exhausted through the verdant Bosnian countryside near Srebrenica he was captured by Bosnian Serb forces and loaded onto a lorry alongside thousands of other Muslims. The convoy stopped in a remote field. Nedžad was told to get in line. He knew that the killing was about to start. “We were tortured and dying for a drop of water,’ recalls Nedžad, now 38 with a young family of his own. “We were forced to take off our clothes. One of soldiers tied our hands in the back. At that moment I, a 17-year-old boy, realised it was the end. “I was left for dead, but the soldiers did not know it. They were shooting the other wounded. I wanted to die but did not dare to call them to kill me. I was bleeding and waiting to die,” says Nedžad. After days of wandering through the woods, hiding in the streams, sleeping in the grave-yards, Nedžad managed to reach the territory under Bosnian government control. On Monday, 21 years will have passed since the single greatest atrocity on European soil since the Second World War: the genocide of 8,372 Bosnian Muslim men and boys in Srebrenica during the Bosnian war. The anniversary will be especially poignant in Glasgow this year, as a team from Bosnia and Herzegovina will be taking on Scotland at the homeless world cup. Four members of the Bosnian side survived the genocide at Srebrenica. Back in July 1995, Nedžad’s father, uncle and any other relatives sought shelter at the Dutch military base in Potočari, just outside Srebrenica. None survived. Nowadays Nedžad works in import and export for a small car company back in Srebrenica. But life in the town has changed dramatically since the war ended in 1995. 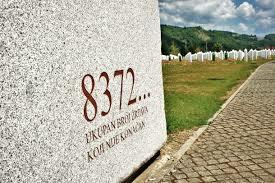 In the days of the former Yugoslavia, Srebrenica was a mixed town with a significant Muslim population. Now Srebrenica is part of Republika Srpska, the autonomous Bosnian Serb statelet created in the Dayton Peace Accords. The red, white and blue of the Serbian flag flies from local cafes and government buildings. In March, the Bosnian Serb wartime leader Radovan Karadžić was found ‘criminally responsible’ for the Srebrenica genocide at the UN tribunal in The Hague. But, says Nedžad, “Karadzic’s and (general Ratko) Mladic’s work remains in place here in Srebrenica forever. We as a community are totally devastated. A memorial service organised by Remembering Srebrenica Scotland will be held at Cathcart Old Parish Church in Glasgow on July 15 to remember the victims of the genocide. Resad Trbonja will never be able to forget April 1992. Back then the tall, strong-featured Bosnian was a rebellious 19-year-old, spending his days strolling around his native Sarajevo in Converse trainers and his treasured Levi’s t-shirt, listening to the Ramones and the Clash. “A week later my life was totally different,” Resad says. Overnight he went from being an ordinary European teenager to a soldier, having to defend Sarajevo against the longest siege in modern history. killing all six of them, just leaving their sledges intact. Today Bosnia is at peace, but the wartime divisions remain, especially in politics. ‘“Bosnia is always the same. You have three different interests that are clashing all the time,” says Resad who works tirelessly to help others learn from the Srebrenica genocide. The recently released Bosnian census shows that the population has fallen by a fifth since before the war. Last year alone 80,000 young people left. “Without a new political force in the country I don’t think see anything changing. We need a new blood,’ says Resad. Nevertheless he is hopeful for the future.